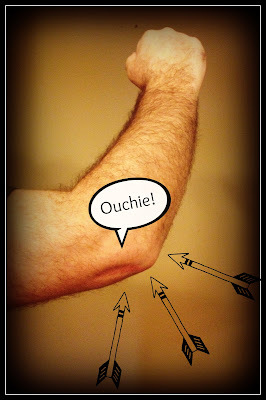 I don't play tennis, so it can't be tennis elbow. Right? But it sure does hurt like it. It usually comes on after I have walked a group of dogs. You know, 2 or 3 at the same time. I try not to do this as a safety issue and as a business policy, but at times it's unavoidable. I guess it's the pulling in all different directions that makes it happen. You would think from years of doing this I would be used to it. But no, it hurts. It hurts a lot. Ok, enough whining from me. Ice and heat, ice and heat.